Copy trading means that you don’t have to decide on your own trades but rather follow those of someone else. It’s an easy way to start trading, as well as pick up some trading tips from others who’re hopefully more experienced. Many brokers now either offer their own “copy trader” systems, or they allow their clients to connect to other third party providers. If you prefer a hands-off approach to trading, this could be something that’s worth looking at. But like most things, choosing the right service and the right traders to follow is essential to success. ZuluTrade is a web portal and trading community that connects traders with those who want to follow them. In order to use ZuluTrade you first need to authorize your account with your broker. Once you have access you can manage your account, and even trade yourself through their web site. There are two copy modes available; auto and manual. In auto mode, you just choose which traders you want to copy. The system then works-out the optimum trade sizes and so on according to your account capital, leverage and risk tolerance. If you choose manual mode you can fine-tune everything including your trade sizes, instruments you want (and don’t want) to trade, the stop/take profit levels and so forth. You can also use ZuluGuard, their capital protection system, to limit the amount of risk on any given trader. Though the system isn’t perfect it can give you a cut-off point so that losses are contained. Pros: Wide range of strategies and styles available. Fast online support. Highly configurable. Cons: Most of the traders are using demo accounts & their profits may not be achievable on a real account. Limited lifespan of traders. Traders are compensated on volume, though are only paid for months with positive returns. eToro describe themselves as a social investment network. On joining-up, you’re given access to their web platform which includes their social hub. The social hub is integrated seamlessly with the platform. It lets you search for profitable traders, review their performance and read feedback about them from current and past followers. Once you’ve found one or more traders to copy, you can allocate a fixed amount to them. The smallest amount is $50. The orders from your chosen traders are scaled up/down according to your copy amount and are replicated like-for-like into your account. Your risk on a given trader is strictly limited to the amount allocated. You still have override ability over any trades in your account. Pros: Minimum latency (trade timing losses) because trades are executed within the eToro platform. Platform is easy to use. Large selection of traders to choose from. Cons: Wide spreads and account charges can get expensive. Accounts are only available in USD. Traders rarely last more than a few months, so you continually need to search for new ones. Tradeo.com also offers a social web trading experience. With their platform traders can share and publish ideas within the community. The notion is that the collective mind of a network of traders is better than one working alone. Traders can allow others to “group follow” their trades. Uniquely the system allows you to search for traders by skill level, by location and by language. There’s a messaging system that allows you to private message other members once you make a connection. Blanket copying of all trades is possible. But if you want to keep a level of control Tradeo allows you to selectively copy trades of your chosen traders with a “one-click” system. Tradeo also has features such as social charts and sentiment indicators. These provide a glimpse of crowd thinking. Premium account holders (those with a balance over USD 1,000) have access to one of Tradeo’s relationship managers. Fifty currency pairs can be traded as well as CFDs on major indices and commodities. Tradeo advertises itself as “straight through” (non-dealing) broker. This means they do not hold dealing positions as counterparty to clients but rather execute order flow with an external liquidity provider. Another big provider of trade copying is Myfxbook. Myfxbook is not a broker. Like ZuluTrade they provide systems that allow trade copying between accounts. At the most basic level, Myfxbook lets traders monitor and analyse the performance of accounts they choose to connect. This service is free. They also discourage strategies that can potentially be higher risk such as Martingale, grid trading and scalping. The second copying service is called SignalStart. If you click the “copy” button on any of the public accounts on Myfxbook you’ll be routed to a partner website called SignalStart. From there you’ll need to register to begin following your chosen trader. SignalStart accepts demo accounts and doesn’t prohibit any particular trading strategies. This one is a niche trading platform and social hub that allows copiers to replicate the success of “trade masters”. When connected to Sirix, you receive trade signals from one or more traders you choose to copy. The system enters the trades into your account automatically, but you still maintain control over any position. Sirix has the same type of program as ZuluTrade and Currensee, in that you authorize your broker to connect your account to their platform. Being a much smaller program, Sirix doesn’t offer such a broad range of trading styles and strategies as the bigger services mentioned above. 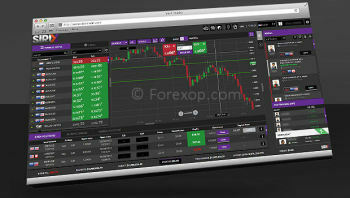 Pros: Integrated web based trading/social platform. Cons: To few traders. There’s only a relatively small network to choose from. This is another niche social trading platform. FxStat is basically a “bridging service” that connects traders with those who want to replicate their strategy. On joining FxStat, you’re able to review, analyze and copy other traders in the community. As a follower, you first need to have an existing account with a broker. You also need to have access to MetaTrader, TradeStation or ActiveTrader – they don’t have a web platform. You then need to install the software that will connect your account to FxStat’s platform. On completing the setup, you can then review and manage those traders you want to copy. The orders from your selected group of traders are then be automatically sent to your MetaTrader account and are followed as an external signal. Pros: Performance tool allows you to analyze the returns of traders (signal providers) in the hub. Cons: The setup requires installing additional software. There are fewer signal providers available because it’s a relatively small community. Nice article about social copy trade platform. It is really good things to copy from expert traders. New traders can learn from expert and earn profit like as boss. Can you provide more copy trader platform list? It would be interesting to include in this excellent article two recent projects – Darwinex and Ayondo . Great info. I like the idea of social trading networks and offer some of signals for more exposure. But eventually, I think every signal provider should have their own website and independent signal business.